A demi-glace that has a perfect balance of flavors is critical for beef entrées. Only Knorr® Demi-Glace delivers a perfect balance of beef, mirepoix and tomato flavors. Balanced, rich flavor created by chefs. 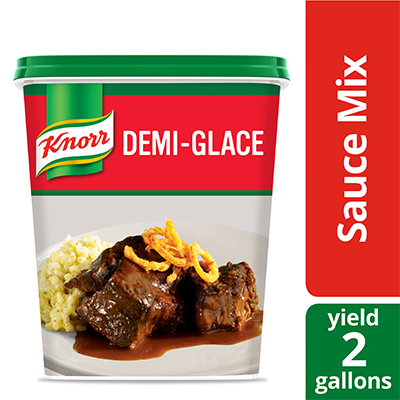 Developed specially for chefs, Knorr Demi-Glace Sauce Mix is ideal for creating your favorite signature dishes. Offering a quick, cost-effective way to create gravy and specialty sauces, this demi-glace mix delivers a perfect balance of beef, mirepoix, and tomato flavors that is certain to impress your guests. The demi-glace sauce mix comes in a dry format that is easy to prepare: simply add sauce mix to warm water, whisk until smooth, cook to 185 degrees Fahrenheit for 30 seconds, and serve. Ideal for restaurants, catering services, and other fast-paced kitchen environments, this demi-glace sauce mix brings premium quality and outstanding efficiency to any culinary establishment. 1. Add mix to warm water (not boiling). 2. Whisk until smooth. 3. Heat to 185 °F while stirring frequently for 30 seconds.